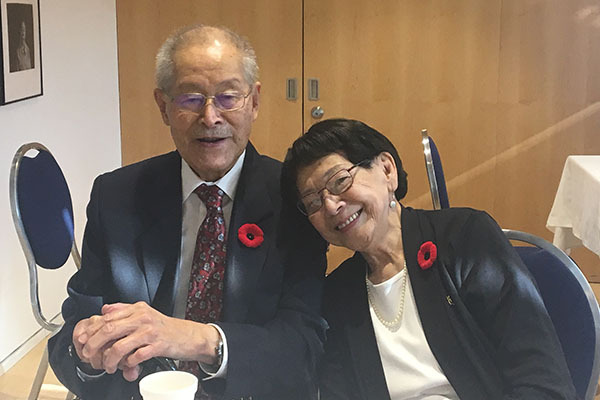 Min Yatabe and his wife, Lydia Yatabe, enjoying a bento lunch after the Remembrance Day ceremony. 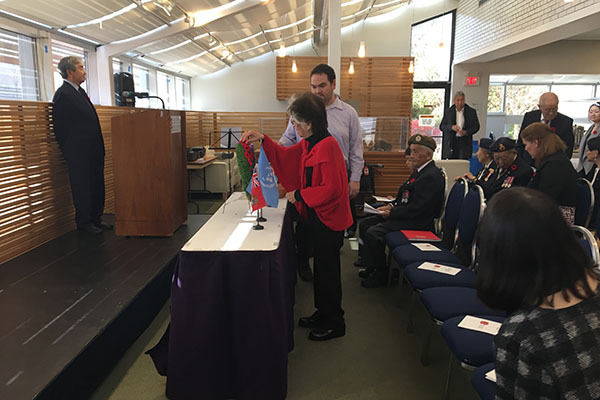 Japanese Canadian veterans were honoured in a Remembrance Day ceremony on Nov. 9 at the Japanese Canadian Cultural Centre. 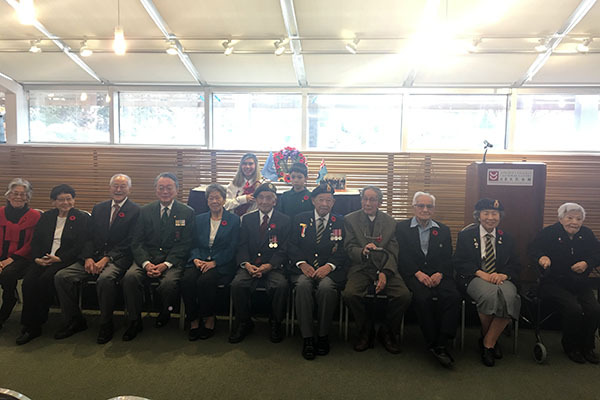 Five veterans from the Second World War and Korean War, along with their families listed to speeches from Min Yatabe, Frank Moritsugu and Tak Irizawa, as well as a playing of the Last Post by Kennedy Liddle and reading of In Flaunders Field by Timothy Takasaki. 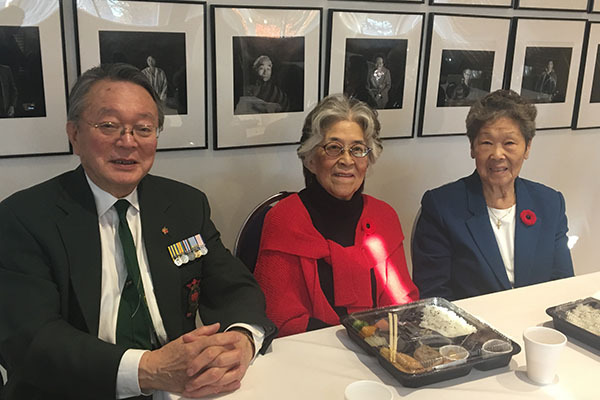 The ceremony was followed by a bento lunch, where veterans reconnected and shared old stories and photos with the younger generation in attendance. While there were five veterans at the ceremony, there were 211 Japanese Canadian soldiers that enlisted during the Second World War. Of those, 148 volunteers were included in the mass expulsion in British Columbia after the bombing of Pearl Harbor. Most of these soldiers were send to Southeast Asia with British intelligence forces as interpreters for Japanese prisoners of war. Second World War veteran, Frank Moritsugu, who has research the topic extensively, said in his speech, there were two nisei servicemen who were killed in the war. First was Minoru Tanaka of the Canadian Armoured Corps from Saskatchewan, who was killed in Europe when a German bomb hit the tank he was in. Second was Leading Aircraftsman Claude W. Mawatari of the Royal Canadian Air Force. There were also three nisei servicemen who were injured in the war. Tamotsu Matsuoka with the Royal Canadian Engineers and from Alberta was injured by a grenade in Europe. Then there was George Suzuki and Fred Nogami, who were among seven of 23 men who survived when their flying boat bound for Hong Kong crashed into the sea shortly after takeoff. 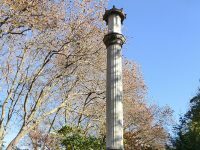 Take a look at photos of the veterans, widows and their families during the ceremony and at the following luncheon. 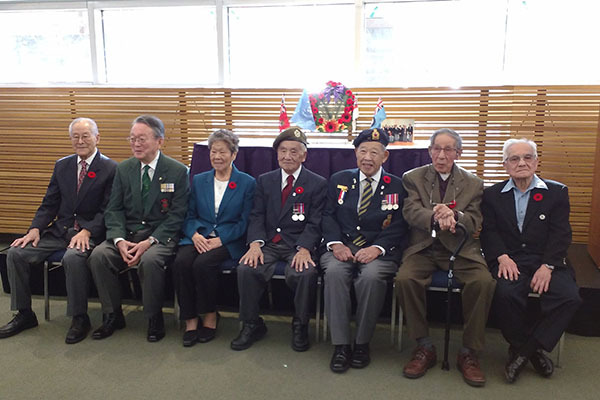 While there are certainly less Japanese Canadian veterans in these photos compared to past ceremonies, it makes it all the more clear the importance of honouring and remembering their contributions and legacies. 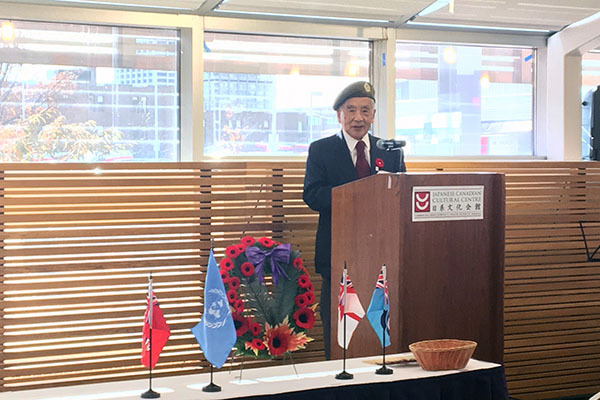 The ceremony on November 9th was to honour Nikkei veterans from the Second World War and Korean War. (Left to right): Roy Matsui, Tak Irizawa, Shizue Kobayashi, Frank Moritsugu, Min Yatabe, Ray Takeuchi, Tom Nishio. Min Yatabe, a Second World War veteran, was part of the intelligence unit, sent to interview PoWs. He enlisted once he turned 18, when Japanese Canadians were allowed to join the army, after being sent to work on a farm in Ontario when the war started. Timothy Takasaki reads In Flanders Field, by Major John McCrae to the room of veterans and their families. 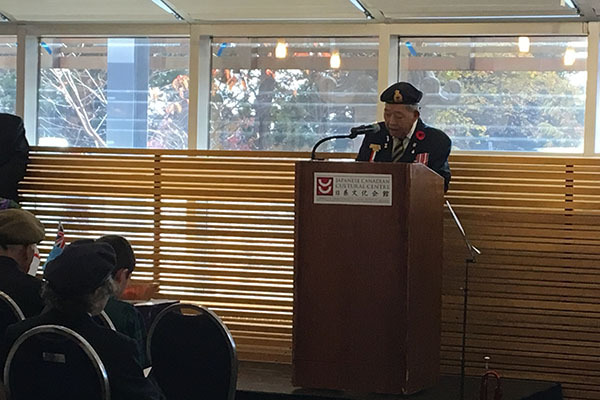 Frank Moritsugu, a Second World War veteran gives a speech about the Japanese Canadian contribution to the war. In the Second World War, Japanese Canadians were allowed to enlist when Britain needed Japanese language interpreters to deal with PoWs. Moritsugu was one of 148 Japanese Canadian volunteers that had been recruited after the mass expulsion of Japanese Canadians from the coast. Kazue Irizawa places a poppy on the wreath at the end of the ceremony. 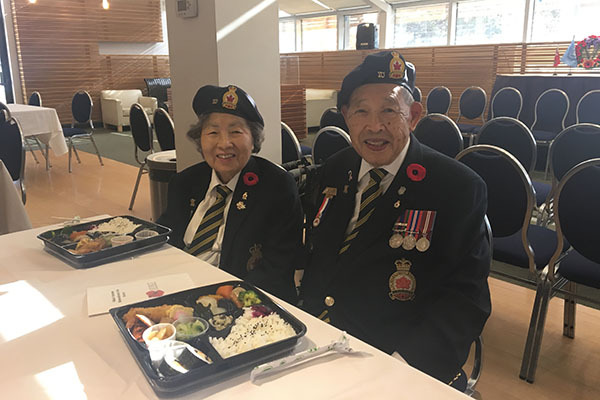 After the ceremony, veterans and their families were invited to a bento lunch like Min Yatabe and his wife, Lydia Yatabe. Yatabe recently was part of Todmorden Branch 10 of the Royal Canadian Legion's parade and candlelight memorial service in memory of veterans who had lost their lives to PTSD-related issues. He was asked to place a wreath in memory of soldiers who took their own lives. Roy Matsui, who is the architect behind Momiji Health Care Society's building in Scarborough is also a Second World War veteran. He attended the ceremony with his wife, Mary. Tak Irizawa and his wife, Kazue and Shizue Kobayashi fill. Tak spoke during the ceremony on behalf of Korean War veterans. 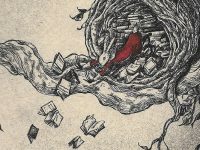 During his speech, Tak spoke of Lynne Kutsukake's new novel, The Translation of Love and the important story it tells about repatriation. 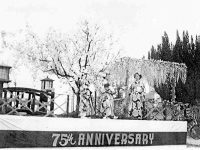 The nisei veterans and their spouses and widows of other nisei veterans together in a photo with the youngest generation of Japanese Canadians. 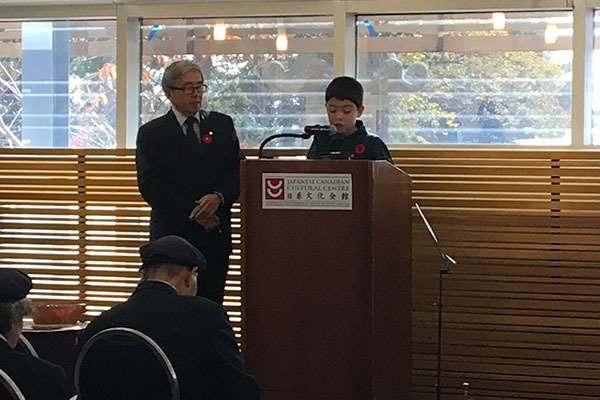 While the number of veterans has certainly gone down in the last ten years, it expresses just how important it is to continue to honour these veterans and pass on their legacies and share the unique experiences of Japanese Canadian veterans. (First row: Kazue Irizawa, Mary Matsui, Roy Matsui, Tak Irizawa, Shizue Kobayashi, Frank Moritsugu, Min Yatabe, Ray Takeuchi, Tom Nishio, Lydia Yatabe, Mitzue Takeuchi. (Second Row): Kennedy Liddle, Timothy Takasaki. Davies family seated on the left. Can you identify the men on the right? Would also like to know if you have a staff historian. Have documents from the Br. Archives on the Canadian Nissei in SOE, SEAC.